Double Roll Crushers are designed for single-pass size reduction of medium-hard to hard materials such as rock or ore to a nominal minus 10 mesh. Topsize is approximately 13mm and final fineness typically passes a No. 10 (2mm) opening, depending on material type. 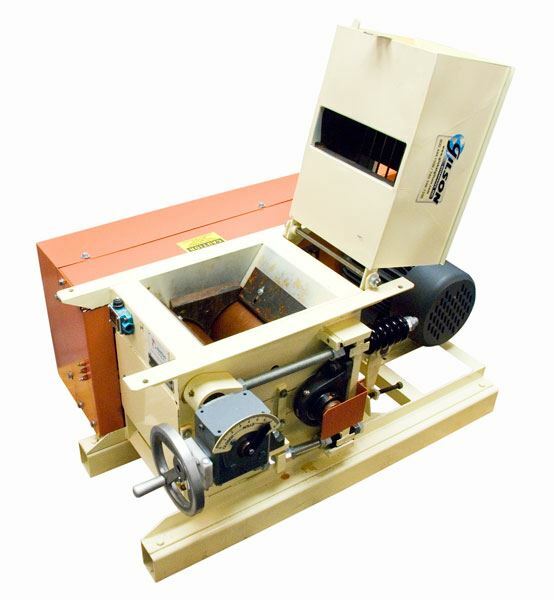 Roll Crushers work well in preparing samples for further fine reduction using a pulverizer. Output size is controlled by adjusting the gap between the rollers using a hand lever. Feed hoppers offer high capacity, open easily for cleaning and maintenance access, and feature an electrical safety interlock that shuts down power to the unit when the hopper is opened. The crushers are rugged with easy-to-operate capabilities that meet the rigorous demands of laboratory and pilot plant operations. The Double Roll Crushers are mounted on a heavy steel base, include strong relief springs, and are fully-equipped with safety guards. These crushers are constructed of fabricated steel and equipped with a fabricated steel drive guide for operator safety. They have a tilt-design feed hopper, cast Ni-roll hard facings for long-life, relief springs, and heavy-duty pillow block bearings. LC-13 Marcy® Double Roll Crusher features 6.5x6in (165x153mm), Dia.xW heavy 304 stainless steel rolls with Ni-Hard facings. The 2hp TEFC motor with V-belt drive produces a uniform speed throughout the crushing process. This model is capable of reducing most rock-like materials of 0.5in (13mm) feed size to minus No. 10 (2mm) at a capacity up to 3,000lbs/hr. Operates at 60Hz. Voltage of 230V or 460V must be selected at time of order. LC-14 Marcy® Double Roll Crusher features 9x12in (229x305mm), Dia.xW heavy 304 stainless steel rolls with Ni-Hard facings. The unit features a V-belt drive, with a 5hp TEFC motor that produces uniform speed throughout the crushing process. It can reduce most rock-like materials of 0.5in (13mm) feed size to minus No. 10 (2mm) at a capacity up to 8,000lbs/hr. Operates at 60Hz. Select preferred voltage of 230V or 460V when ordering. LC-14F model has the same features and capabilities as the LC-14, but operates at 50Hz. Voltage must be selected at time of order, choosing from 220V, 380V or 440V.